The first year of life for your infant is full of change and growth. Infants require a lot of engaging care to encourage mental and physical development. They also need frequent feedings, diaper changes, and cleaning. Leaving your baby in the care of another can be scary and stressful, which is why it is so important to find a trustworthy and knowledgeable child care center to care for your baby. We understand how much trust you place in child care services – and you want to know your child is in good hands. Our infant daycare is designed to offer a safe and secure place with knowledgable childcare professionals who honor your family’s routine. At Apple Tree Orchard Preschool & Childcare, our childcare professionals are focused on the care of your child, providing a safe and engaging infant daycare and child care center for children. We want to help your children learn and grow every day. Allow our caretakers to provide your infant with the attention and affection they need. At Apple Tree Orchard, your child’s safety is our number one priority. Our facility has key fob security access so that only current staff and parents have unrestricted access to the building. We also provide internet camera access for all currently registered parents. Parents can view any one of the 48 cameras we have throughout the building at any time. Our playground fences are six-foot, and we require all visitors to enter and exit through the building for added security. 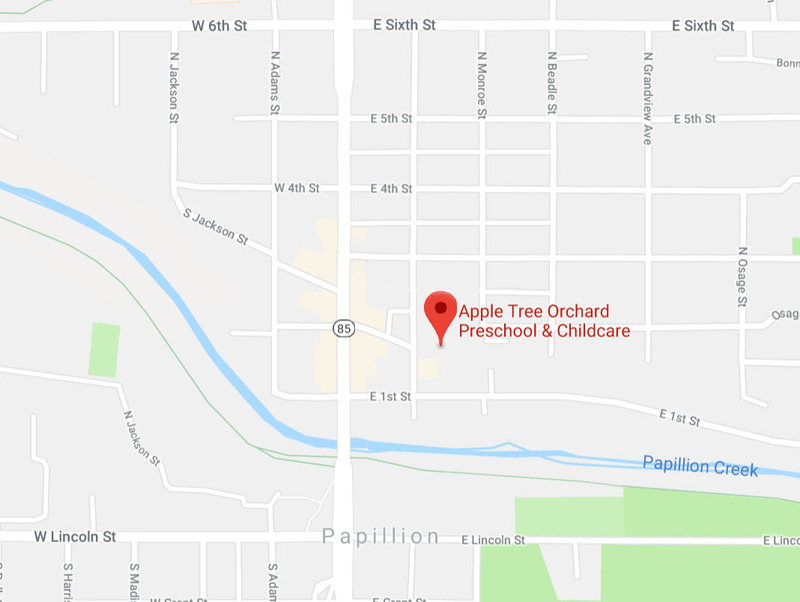 When you need a trusted infant daycare center for your baby, turn to Apple Tree Orchard in Papillion. Our child care center provides daycare services for infants six weeks and older, all the way up until children are ready for kindergarten. We offer both full-time and part-time care to fit your unique schedule and child care needs. For more information about our infant care services, or for pricing, call us today at (402) 827-7537 in the Papillion and Omaha area. Contact Us Online to learn more!